Fuji X-E2 vs. X-E1, a detailed comparison. In this post I’ll address what I see as the major differences between Fuji’s X-E1 and their newly released body update, the X-E2. The refreshing thing about how Fuji is operating these days is all their recent X-Series cameras (aside from the X-A1) share the same APS-C “X-Trans CMOS” sensor so picture quality is nearly identical across all the bodies with the possible exception of the X-E2 and its Lens Modulation Optimizer (more on that later). Removing picture quality from the equation makes doing a head to head comparison much easier. But there are still some notable differences. Let’s take a look. If you’d like to purchase one of these cameras, or anything else for that matter, please consider using one of the affiliate links below. Your price does not change, but a small percentage of the purchase price goes to me, which helps keep this site going. Thank you. Fuji touts the X-E2 as having the “World's fastest AF speed of 0.08 sec.” It’s certainly quicker than the X-E1, but in good light, the X-E1 still holds its own remarkably well. Where I notice a huge difference is lowlight situations. With the AF on both cameras set to the centre point, the X-E2 locks focus much faster, and on things that the X-E1 refuses to focus on at all. If you’re a night-time street shooter, the X-E2 should be at the top of your list. Another consideration will be your current lens line-up. As noted in my extensive comparison, if you have and plan on keeping the FUJINON XF 60mm f/2.4 Macro, the X-E2 will treat you much better in the AF department. These are big ones if you have small kids or rambunctious pets you’re trying to capture. The continuous AF in the X-E2 is a big improvement, if only for the half shutter press it takes to engage it. The savings in battery life alone make it a big upgrade. I would personally make use of Face Detection in the X-E2 along with Continuos AF if I was chasing kids around. In my use, Face Detection works great. When I got my hands on a pre-production copy of the X-T1, continuous AF was an essential test. The X-T1 held up pretty well. The X-E2 did not. If continuous AF is something you really need, look at the X-T1 instead. Well, I was going to lead with my biggest gripe about the X-E1 being that you had to use a second hand to get at the AF button in order to change your AF point, but Fuji has added the Down Selector within the Function Settings on page 3 of the Shooting Menu. 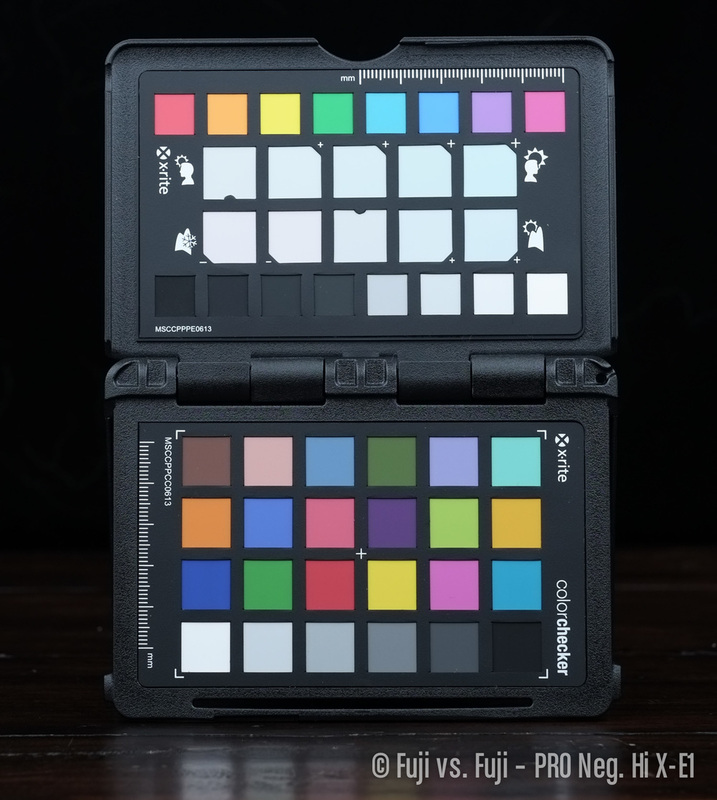 It can be configured to be any of the usual Fn items as well as the AF button so the X-E1 now behaves just like the X-E2. No more having to use your other hand to hit the AF button. I can’t believe I didn’t know about this feature, but I didn’t get the X-E1 until well after the firmware update announcement in June. With all that said I’m still a firm believer that the X100S has the AF selector in the proper place and that’s where I set it on my X-T1. The only real differences between the two in handling now are the separation of the AF-L and AE-L buttons, the change in placement of the “Q” menu (the X-E1 has it right IMO), the lack of a dedicated View Mode button, the added Fn2 button on the X-E2, and the extra 180x setting on the shutter speed dial. Other than that it’s pretty much a wash. I personally like the more clicky feel of the buttons to the left of the screen on the X-E2. Others might like the larger size of them on the X-E1. The D-pad is barely smaller on the X-E2 to accommodate the larger screen, but this is a worthwhile tradeoff, and something I don’t even notice. This is where things get interesting. The EVF on the X-E2 has the same resolution OLED screen, but the refresh rate is so much faster. I handed my camera to another fellow street shooter and he could tell the difference immediately. The lag on the EVF in the X-E1 is what was holding him back. Things have improved even further in this department with the release of firmware Ver. 2.00. Now, if you don’t do a lot of really lowlight shooting, or you primarily use the LCD to compose, this might not be a problem for you. See “Rear LCD” below. One area where the X-E1 is preferable to the X-E2 is how using just the EVF works. When EVF-only is selected by cycling through the View Mode button options, shooting and menus happen in the EVF as you’d expect. Where the X-E1 clobbers the X-E2 is playback still happens on the LCD. With the X-E2, playback maddeningly happens in the EVF as well. Adding insult to injury, the X-E2 no longer has View Mode button, so if you want to get images on the LCD again, you’re gonna be hunting through some menus. Maybe some people prefer that it works like this, I really hope Fuji fixes it with an upcoming firmware update. It seems like a huge oversight. To my eye, there is no perceivable difference in the response time of the LCDs on the X-E1 and X-E2. There are differences in the size, and the toughness of the screen. The former is not really that big of a deal in my opinion. The size of the LCD on the X-E1 is perfectly usable. The latter can be solved quite easily with the purchase of an Expert Shield or something like it. This is something I’d recommend doing, even on the X-E2 (don’t bother with anti-glare, it makes the screen harder to see). It comes in super handy if you take someone’s picture and want to send it to them right away, or you want to post it to your social networks. I haven’t used the WiFi transfer to the computer yet. I’d rather just use the built-in SD reader in my MacBook Pro. This is another one I have yet to fully test. What I’ve been able to glean from research is that Fuji’s LMO works on blur that results from diffraction, and little else. If you’re consistently pushing your lenses past ƒ/11 where diffraction really starts becoming an issue, and you are a JPEG shooter, you will certainly see some gains in sharpness from the X-E2. RAW shooters can carry on just fine with the X-E1’s and safely ignore this feature entirely. One data point I haven’t been able to find yet is whether engaging the LMO drains the battery any faster. It’s a processor-based task so it would stand to reason that does. I hope to have time to capture the difference the LMO makes visually soon, and I’ll update this post with my findings once I can test things out properly. I haven’t heard a lot of people complaining much about the quality of Fuji lenses so far. Things can only get slightly better, and that’s great. Not much more to say about this one. It’s a nice addition to have an something I didn’t even know about until after I bought the camera. Not much more to say about this one either, but the ±⅔ of flash compensation found on the X-E1 was much too little. This has been a pretty serious bone of contention for X-E1 users wanting to upgrade. Accusations of steeper tone curves, cooler, less pleasing skin tones, and more reds and magentas have all been thrown at the X-E2. I personally can’t say that I shot with both cameras in controlled conditions often enough made a judgement call, nor was it something I noticed in day-to-day shooting. Now that I’ve finally had a chance to setup a controlled test, we can make an objective comparison. My subject is an X-Rite ColourChecker Passport. All cameras settings were normalized to their defaults with the exception of White Balance which was set to 5,000K. This will really come into play as we’ll soon see. The same 56mm f/1.2 lens was used on both cameras with a hood attached. The aperture was f/5.6. My shutter speed was set to 1/160th of a second on both caemras, which is as close to the X-E2’s max sync speed of 1/180th of a second as the X-E1 can get. Flash compensation was set to -⅔ EV on both cameras to trigger the two LumoPro LP180 speedlights with shoot-through umbrellas placed on either side of the ColourChecker, and set to 1/16 power. Nice, even, balanced light. Photometry (metering mode) was set to “Multi,” but that shouldn’t matter a great deal as the aperture, shutter speed, and ISO were all preset. I was expecting I would need to post screen captures of histograms to precisely determine the differences between the way these two cameras render JPEGs. I was wrong. The difference is immediately noticeable, and seems to go beyond colour and tone curves. The white balance also appears to be very different. Different enough that I’m tempted to redo the test once I figure out how to get these white balances, uh, balanced. I actually had to recheck my camera because I thought for sure something had been set wrong. My white balance must have been set a couple thousand degrees cooler on the X-E2. Nope. 5,000K on both, and no modifications to the WB shift page on either camera. Still, I redid the test, watched carefully that both flashes were firing and they were. The second test left me with the same result. The only other thing I could think of that might have been having so dramatic an effect was the built-in flash. Perhaps that Super Intelligent flash on the X-E2 is too smart for its own good. So I redid the test a third time and bounced the built-in flash safely away from the ColourChecker. Same result again. Let’s have a closer look. Not only is the contrast punchier on the X-E2, but the image is significantly cooler and more magenta when both cameras are set to 5,000K. This is a good note to anyone who might be comparing how lenses render when using them on different bodies. The same body really needs to be used for these kinds of comparisons. The difference in PROVIA alone is huge, and while this is hardly the image to judge colour rendering for actual pictures by, I have to admmit I prefer the look of what the X-E1 is rendering to JPEG. The difference is also large enough that adding a “classic” option to cameras to bring this colour rendering back might not be a bad idea. User disappointment in what Fujifilm has done with the defaults of their Film Simulation Modes could warranted as things have obviously changed. The key word up there though is “defaults.” Settings are meant to be adjusted and—so long as the original colours are still attainable—it shouldn’t be a terribly big deal. Overall, it appears as though the X-E2 renders JPEGs slightly underexposed (it appears much darker because of the contrast, but the differences between the histograms is not major), a fair bit more contrasty, and quite a bit cooler compared to the X-E1. One might wonder why these changes to the Film Simulation Mode aren’t applied to older cameras via firmware updates. I think Fuji have done the right thing in now applying them given how important colour is. It does seem curious that they are as quiet about the whole thing as they are. If they felt improvements have been made to their profiles, you’d think they’d tout that as a feature of the new cameras. Below are the remaining Film Simulation Modes for comparison. The difference in contrast is less extreme here—Fujifilm were apparently more happy with where VELVIA was with the X-E1—but you can clearly make out a serious difference in white balance which pumps the blues up considerably. The same story continues. A fairly major shift in this overall white balance. The difference in contrast here is quite noticeable. And finally PRO Neg. Std. That’s pretty much it. With all the firmware upgrades Fuji have been so awesome to push out, the X-E1 is still a really capable camera, even in the face of its successor. For me, the X-E2 was a must-buy when it was released. Partly because I wanted an all black camera, and my wife chose silver when we got the X-E1, but the main reason is autofocus and EVF performance in lowlight. For someone looking to buy a camera to use primarily in decent to good light where they won’t be chasing youngsters around, the X-E1, especially at its discounted price, is an excellent buy. For those of you who are madly in love with the colour rendition of JPEGs in the X-E1, you might want to hold onto what you have and maybe even grab a backup X-E1 while you can. It appears Fujifilm certainly are tinkering with how exactly their film profiles are rendered as new cameras hit the scene.